watercolor haiku, "Kettle Mountain Gold" 3"x6"
Sometimes all you have time for is a quick note to self. Some might call that a haiku in paint. My friend Kate owns a painting like this by me that is 1'x4'. 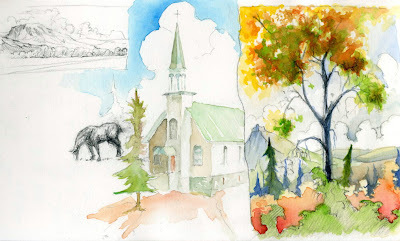 She saw the Kettle Mts in a state of glowing splendor and sent me the digital picture I did this watercolor from. Thanks Kate! Good to know that home is just over those golden peaks. Acadia National Park, Maine, has a system of carriage roads established in the 1800's by the Rockefellers and restored by Ed Winterberg. I get the opportunity to work for Wildwood Stables next summer driving horses and giving tours of the Island. What a deal. Working horses and painting where Thomas Cole, Fredrick Church and others painted and many still do. I met New York pleinair painter Walter Mosely here and would have met more but I was busy painting too. My journal is filled with notes to explore on this winter's easle. "Strokes carry a message whether you will it or not. The stroke is just like the artist at the time he makes it. All the certainties, all the uncertainties, all the bingness of his spirit and all the littlenesses are in it." Robert Henri, "The Art Spirit"
We've had more snow this winter than we have had in a long time. It's not a record by any means but it is notice to those that have moved here from warmer climates in the last 20 years of drought. Snow is good. It replenishes the streams and acquifers which makes for a good hay season and stabilizes the economy that depends upon run off for electricity, irrigation and navigation in the Columbia river. When I go out to the hay barn to feed the horses I walk with the herd up to the barn so I can watch the white tail deer that have crawled under a whole in the back wall and are eating hay. Last night there was a doe and her two yearlings as well as 3 Hungarian Partridges. I didn't think 'Huns' were up this high in the Sanpoil and hung around the open slopes of the Columbia. We also have a flock of Pine Grossbeaks that we only see on occasion. They are a lovely red and grey that eat seeds from the evergreens and bushes. I watched these deer huddeled under some trees in the pasture scratching for any green stuff or lichen they can find. The snow was warm when it fell but it got colder making the top into a crust which the deer breakthrough and have trouble going. It's a bad thing as coyote's can run on top of the snow and take down the deer that have trouble eluding them although it is a good thing for the moles, voles and mice that make tunnels under the snow. It's comical to watch the coyotes listening for critters under the snow that they pounce on through the snow. We have to watch for wildlife that use the highway for their travels as it is easier than making their way through the deep snow. Their are many casualties although the eagles and raven, opportunists that they are, do well on the carrion.